As a chapter 13 bankruptcy lawyer in Chicago, my goal is to help people reorganize their debt or to eliminate their debt so that they can improve their financial situation. This often means saving a home from foreclosure. It also may mean saving a vehicle from repossession. It also could mean stopping a wage garnishment and agreeing to repay a small portion of a debt over a three to five-year period. To make all of this happen, many things have to line up in place perfectly. One of the things that I found most helpful, yet not without its difficulties, is to have my clients be set up on payroll control. This means, in theory, that the chapter 13 plan payment will be deducted from the debtor’s pay shortly after the case is filed until such time that the case is closed and discharged. With payroll control, there are a couple of hurdles that one must jump over. The first hurdle is that the employer must abide by the federal payroll control order and actually do what the order states. This means properly deducting the right amount out of the debtor’s pay and very importantly, forwarding that money to the chapter 13 trustee so that it can be used for creditor disbursements. The second hurdle is that the debtor must remain employed by that company. In a recent chapter 13 bankruptcy filing in Chicago, the debtor lost her job two weeks after the case was filed. In that case, there were no funds to be deducted from her pay and the case soon dismissed on the trustee’s motion to dismiss. Another helpful idea, but not always possible, is to require the debtor to provide the first monthly plan payment in advance at the time of filing. By doing so, the debtor will have one payment in the till before one is actually required. Now you might think that this puts the debtor way ahead in the game. In reality, this first plan payment may be just enough of a payment whereby the plan can be confirmed. You see in some cases the payroll control order may be delayed. In some cases the debtor may not actually be making the proper amount to the trustee. By having the first proposed plan payment in advance at the time of filing, the debtor stands a greater chance of having the case confirmed. The other major pitfall for chapter 13 bankruptcy cases is time. In chapter 13, you are asking a person who has not been successful with payments, to stay engaged in a 36 to 60 month payment plan in an effort to save property or repay creditors. The odds of that happening without interruption, without delay and without a breach is quite rare. I would estimate that about 15% to 20% of all chapter 13 cases result in a discharge or a completed payment plan. It is much more likely, that the debtor will make some payments, but not all payments under the plan. In those cases, I can often recommend a re-filing option. This is where the debtor obtains a second bite at the apple in an effort to save property or repay debt. While this is not always possible, in most cases, the debtor will be given a second opportunity to make a payment plan work. 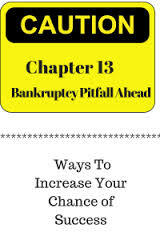 As you are now aware, chapter 13 is not an easy undertaking for the debtor or for the bankruptcy attorney. However, it is possible provided one is gainfully employed, dedicated to the task at hand, and willing to sacrifice in terms of budgeting to make the repayment plan work.